One of the remarkable traits of the Telluride Bluegrass Festival is that there are plenty of opportunities to hear great music throughout the town for free. Of course, there are street musicians playing their hearts out as festival-goers enter Town Park, but Planet Bluegrass offers a series of free “workshops” during the four-day run that provide more intimate glimpses at some of the artists who may — or may not — appear on the main stage. Among the artists featured throughout the four-day event were Abigail Washburn, Bela Fleck, Sarah Jarosz and the Punch Brothers. On Saturday afternoon (June 18, 2011) at Elks Park, fiddler Sara Watkins gave one of those workshops — which turned out to be a cozy hourlong performance with some of her a-list friends, including Nickel Creek bandmate Chris Thile, Old Crow Medicine Show’s Willie Watson, three members of the Decemberists (head honcho Colin Meloy, drummer John Moen and bassist Nate Query), Tom Petty and the Heartbreakers keyboardist Benmont Tench, Abigail Washburn and Crooked Still fiddler Brittany Haas. Watkins (shown at the Decemberists show), who teaches at the RockyGrass Academy in Lyons, Colorado, every chance she gets, breezed through numbers such as Jimmie Rodgers’ “Any Old Time,” which she learned off a Tony Rice recording, “My Friend” and “All This Time.” All three tunes are on her self-titled debut album that was released in 2009 (Nonesuch Records). That wasn’t necessary as she delighted the understanding audience with the traditional (“Jordan Am A Hard Road To Travel” with accompaniment from Hass and Watson) and covers from artists such as John Prine (“Mexican Home”), Linda Ronstadt (a lovely “Different Drum”) and John Hartford, the singalong set closer “Long Hot Summer Days” that’s also featured on her album. There was more “work” to be done later in the day for the Decemberists and Watkins, who is touring with the Oregon-based band (“It’s been a treat to be playing with her this year,” Meloy said). 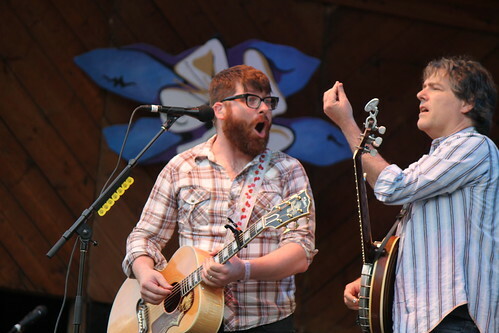 At around 6:30 p.m., the Decemberists followed Yonder Mountain String Band on another day of eclectic acts that featured 2010 band competition Nora Jane Struthers and the Bootleggers, Emmitt-Nershi Band, Tim O’Brien Band and Sam Bush Band. The Decemberists were a band “I saw for the very first time on this very stage all the way back in 2005 and it changed my life,” said Jarosz, a rising star and multi-instrumentalist on the roots music scene who had the honors of introducing her life-changers. Meloy charged through selections from their most recent release, The King is Dead, including “Down By The Water,” “June Hymn,” and “Rox in The Box.” Meloy sarcastically said he was offering one number “free of charge” as the campaign theme song for Michele Bachmann, the Republican and Tea Party supporter who recently announced her run for president in 2012. The “Calamity Song,” drew raucous cheers and applause from the left-leaning crowd. On a night of wisecracking and frivolity, Meloy did get serious for a moment, mentioning the absence of one of their bandmates, keyboardist Jenny Conlee. 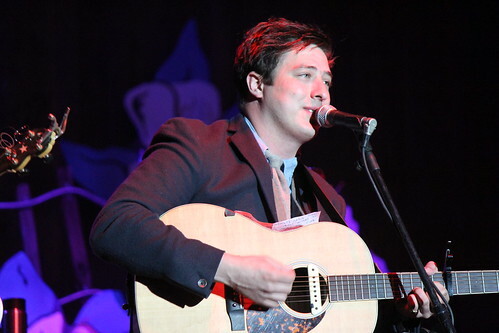 As a result, Watkins who had been playing fiddle and singing harmony before Conlee’s departure, has taken on a bigger role with the Decemberists. But she filled in admirably, even pounding the drum on “The Rake’s Song,” an explosive cut off 2009’s The Hazards of Love that was one of the many highlights from a 75-minute set that took their brand of art house folk-rock to glorious heights. Watson (left, with Cory Younts and Winston Marshall), who was considerably more low-key earlier in the afternoon with Watkins, also saved his best for last. A wild and wooly “hillbilly” Old Crow Medicine Show rivaled the previous day’s set by Trampled by Turtles for equal parts madness and merriment. Watson, who talks as fast as he plays guitar, brought some “high-altitude proselytizing” to the night’s proceedings with “I Hear Them All” and even managed to slow it down a bit on a duet with special guest Emmylou Harris (“We’re All In This Together”). It was the Nashville-based band’s second visit to the festival, and they made quite an impression as revelers stayed on their feet throughout the set that ended well past midnight. 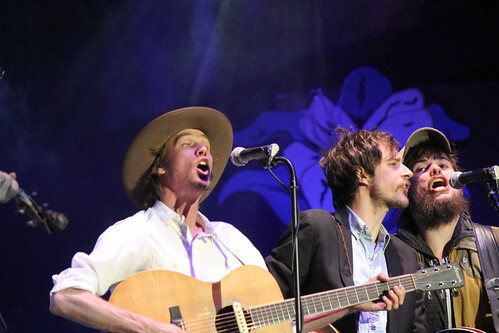 The band was visited by members of English folk-rock phenoms Mumford & Sons, including Ben Lovett and Winston Marshall on “Raise A Ruckus” and “Alabama High-Test” followed separately by heartthrob Marcus Mumford (right) on “Take ‘Em Away.” All three rushed off to a NightGrass show at the Sheridan Opera House shortly afterward. Old Crow Medicine Show — that also includes charismatic co-leader Ketch Secor (fiddle), Kevin Hayes (guitjo), Cory Younts (mandolin) and Morgan Jahnig (bass) stole the show this night, though. A dose of Old Crow Medicine was just what the doctor ordered, and if Mumford & Sons can top that on closing night, we’ll all be healed.